Roundhouse Entertainment is excited to announce that Aussie music icons John Butler Trio and Missy Higgins will be joining forces in January and February for a massive national tour – including two a day on the green concerts. Billed as the Coming Home tour, the name reflects both the title of John's imminent new album and the fact that it will finally reunite two artists whose early careers were closely intertwined. In 2004 Missy was supporting John Butler Trio at Sydney's Hordern Pavilion on the night that her debut hit Scar went to number one and a few months later they were pivotal early drivers for the "Wave Aid" tsunami benefit show at the SCG. The pair won their first ARIA Awards as Best Male and Best Female artists in 2004 and 2005 respectively and even shared their first Rolling Stone cover together. Since those early days, John and Missy have done numerous benefit gigs together and have stood side-by-side in several environmental campaigns but this will be their first national tour together in nearly 15 years. For the a day on the green events, they will be joined by special guests Dan Sultan and upcoming singer songwriter Stella Donnelly. With shows across six states and territories, the not-to-be-missed events will celebrate the release of the new album with John's loyal fan community as well as showcasing the hits that have made John Butler Trio the highest selling independent artist of all time, such as Zebra, Better Than and Ocean. The band's first album in four years, HOME, is released on Friday September 28 (through Jarrah Records). Brand new second single, Just Call, is launched today with a stunning video, adding more clarity to the puzzle that will be revealed with Home. "Just Call is an earnest love song I've had for 13 years which I was finally able to finish in these sessions," John Butler said. "This is the story of how I found my best friend and partner, out in a small town in the middle of nowhere, in a world of 7 billion people." The Home album includes the hit single of the same name which turned people's heads for its complex mesh of poignant lyrics, industrial rhythms and a grinding electronic soul, finding its home on radio across the country. The album takes listeners through an emotive sonic landscape, mirroring the vulnerabilities, joys and tensions of modern life that have shaped the last four years for John Butler and he's looking forward to sharing the stories of this journey live with his fans on his upcoming national tour. "What you're hearing is the destination but getting here felt like an odyssey; some rite of passage that I couldn't go around, couldn't go over, couldn't go under; I had to go through. This album is my most personal work yet and it feels like taking it on the road to connect with fans directly is the final act of delivering this body of work," said John Butler. "This album touches on the anxieties and demons I've been grappling with since the last album, but it's also full of joy, hope and redemption, and I'm looking forward to conveying the stories and passion of this journey one-on-one live with fans." John Butler Trio has expanded to a five-piece band for the Coming Home tour. Hence the name JBT+. It is taking the JBT live experience to a new level. 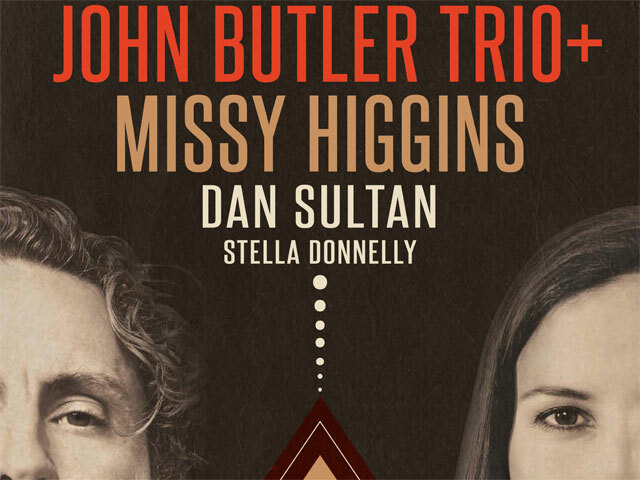 After the Top 5 success of her recent album Solastalgia – and the birth of a baby girl just last month – Missy Higgins will return for this handful of big gigs in early 2019 alongside her long-time musical compadre John Butler. "It will be so good to get out of the house and get back on the road alongside John and his band," said Missy. "I have great memories of all those gigs I did with him when I was first starting out and it will be great to play some really special venues together again after all these years." Missy Higgins is one of Australia's most beloved singer songwriters. She has sold more than a million albums in this country and her classic songs like Scar, The Special Two, Where I Stood, Steer, Unashamed Desire, Everyone's Waiting and Futon Couch have earned her 23 ARIA Award nominations, nine of which she has won. Earlier this year, Missy reconnected with huge numbers of Australians when she was Ed Sheeran's special guest on his stadium tour. Her subsequent Solastalgia tour was her fastest-selling in more than a decade. The Coming Home tour will be the first opportunity music fans have had to see Missy onstage since that acclaimed run of dates. Since the release of his debut album Homemade Biscuits in 2006, Dan Sultan has become one of Australia's most revered songwriters. His electric roots rock sound has won him fans across the country. With a slew of ARIA Awards under his belt – including 2010's Best Male Artist – Dan released the critically acclaimed Killer last year featuring singles Hold It Together, Kingdom and Magnetic. Other fan-favourites from his extensive back catalogue include, Kimberley Calling, Old Fitzroy, Under Your Skin and Your Love Is Like A Song. Raised between Wales and Western Australia, Stella Donnelly got her start singing Green Day songs in her high school rock band. In 2017 she released her powerful debut EP Thrush Metal, embraced by critics and fans worldwide, instantly becoming one of Australia's most talked about new acts. Her lo-fi folk-pop is laced with quick wit, savage social commentary and feminist defiance, with songs like Mechanical Bull and Boys Will Be Boys catapulting the singer onto stages across Australia and the world. Together, John Butler Trio and Missy Higgins have created the soundtracks to countless lives as two of Australia's most treasured singer songwriters. Don't miss this incredible opportunity to witness them both live and in full effect, reunited once more to tour the country for a once-in-a-lifetime show. For all the national tour dates go to the artists' websites for further information and ticketing details. Tickets go on sale 12pm midday on Friday September 21 from Ticketmaster. This summer marks the 18th season of a day on the green, which started in January 2001. After 453 shows and more than three million happy patrons, the a day on the green experience of good food, fine wine and great music in magnificent locations is firmly established as one of Australia's most popular concert events.